Thank you @firechecking, @Syeswr. I've uploaded some of the documentation to CrowdIn.net — you will find it in the "Reference" folder. Currently only the Sound, Network and Touch chapters are uploaded. Have a look and if you are interested in translating it, I will start to upload more chapters. Please note that the documentation uses markdown formatting — please keep symbols like ** and `` intact. These are used for formatting (bold, code, italic). @Simeon, You scared me a little with new files added for translation. Will you add new ones? It's not a problem, I just want to know. I will be adding the main chapter — Graphics, and a smaller chapter Animation. They need some work before I add them, though. Many thanks to everyone translating. Codea looks beautiful in other languages.
.@Syeswr (and others) have put in a ton of hard work creating translations for the reference manual. It's really something to see. Here's a few screenshots of the localised documentation. @Simeon, I'm close to finish the translation in a few days. But, I've another question. I have a problem with the translation. There are many situations where I don't know if there needs to make a translation or not. Color computed by mixing this color and c by amount, where color, c and amount, should not be translated, but I've translated these words, It's good what I did or not? Which of these versions are correct?
. @Georgian the "Syntax" and argument names in the documentation will still be in English. The image below shows the color.mix entry. The parts in red are not translated — the parameter names and syntax details. The parts highlighted in blue (the words "Syntax" and "Returns") should be translated (they are not translated in this example because I have only just added them to the Chapters.strings file). 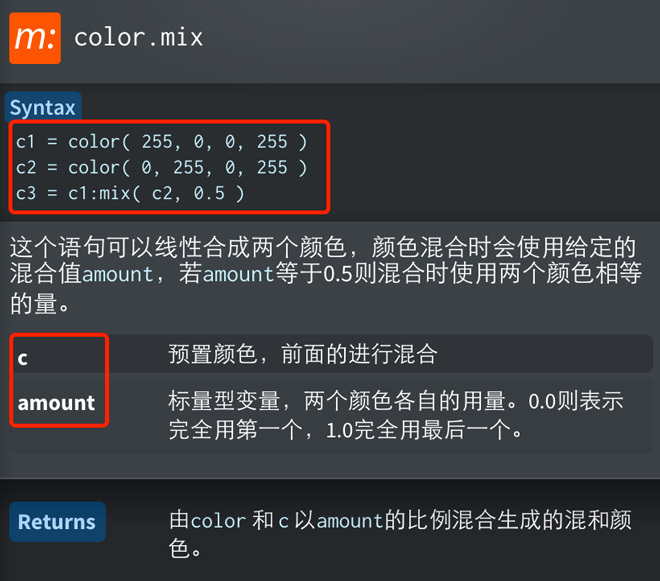 I'm not sure if the variable names like color and amount should be translated — they will always be written in English in the argument list, so perhaps they should be referred to in English. I think you should choose the translation that feels best for you — does it read well enough when you have these variable names in English? @Simeon, You're right. Because they are variable names, not a word into context. I will make another correction to fix this problem. @Simeon, An error occurred on crowdin - All translations are 1% completed. Maybe my translation was deleted or this is an error. What has happened?
. @Georgian it seems they are back to normal now. I think CrowdIn was fixing some bugs I reported. Romanian language 100% completed, but not enough, few hours ago I finished the revision. I've corrected some mistakes and everything is done. @Simeon If you added Romanian language, make an update. Now I wait Codea 1.5, but with patience.
.@Georgian if at any time you would like access to the beta to try your translation, just let me know. Hi @simeon, I would like to see Codea translated to Catalan. Can you enabled it to begin the translation?
. @xavibj I added Catalan a while ago when you posted. Sorry I didn't mention it here. If there have a independent manual for codea such as PDF or something independent from the codea itself. If you have one, can you send it to me? I will preciate for that.
.@lenfien I have the source documentation in YAML format. I'm hoping to be able to write a script to convert it to HTML or PDF. I might even make the original YAML source files available on Github if people are interested. How can I get acess to the beta? Do I have to fully translate Codea? The documentaties is a lot of work, and I think I'm currently the only one translating Codea to Dutch. Thank you for doing some Dutch translations @Hackingroelz. I've sent you an invite to the beta group. .@Simeon. Have this translation finished. I look through . 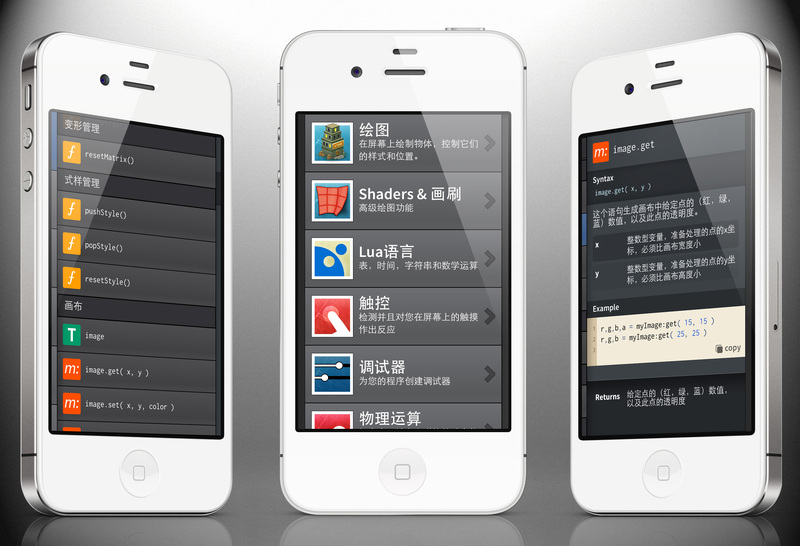 @Syeswr 's Chinese Simplified translation, it seems there still have many problems. (with most of the work done by one person, mistakes cannot be avoided). So if I can still do something to help . @Syeswr 's work. I have no idea whether it is too late?
. @firechecking it's not too late at all — there is still a little bit more documentation to come as well (a few very small items). If you feel you can help, please do. You can suggest alternate translations and vote on existing translations.
.@firechecking I'm glad you can help and I wish we could have a coopreation to improve the quality. Let's have a communication first.Would you please send me you IM id like QQ? I'll contact you. .@Syeswr. I have sent you a message! I'm starting to work on Bahasa Indonesia translation. I'm using more human translation in which I don't translate word-by-word like the result of machine translation. Instead I'm using contextual translation which sometimes the translation of a sentence doesn't really match in words with the source text but conceptually easier to understand by the native user of the target language. And, yes... I'm a native speaker of Bahasa Indonesia. Well... it's quite a lot of work, especially the reference part. I'll work on it in my free time. And if there's another Indonesian here, please review my translation. Thank you. Thanks @bee! It is a huge amount of work, thank you for contributing some of your free time to translate the text. @simeon: I don't know if I could make it through the release of v.1.5 though. But I do hope it will be completed before that. Thank you to everyone who helped translate! Codea 1.5 is ready to go, but waiting on some final translations to be submitted. If you get a chance, please have a look over the translations for your language in case there are any major errors. @Simeon. I will start translate into Danish. Do I need any permission or is it just to get on with it ? Il va y avoir quelques corrections à apporter mais rien de méchant de plus la traduction va être plus simple à terminer maintenant. Is there any way you can see your translations 'live' in codea as you go along ? I have translated almost all text into Danish on the main screen and would like to see what it looks like, is that possible ? I guess some of the translations needs corrections after you have seen it in the rigth context. Thank you for contributing to the Danish translation, @keld_larsen. Unfortunately there is no "live" way to do it. What I will do is upload lots more screenshots, however, so you can see where the string appears in Codea. Would this be helpful? @Simeon I found another way to get arround the problem. I simply have Codea open on my iPad and use my pc to translate, that way I can look at the actual screens and text when I translate. It helped yesterday when I went trough the wiki where you explain the parenthes, quotes and insert options. @Simeon - I noticed that the default template main.lua and New Class are not translated into Romanian. Comments from code are still in English. I have been unable to get to the link... Do you have Turkish... I'm no coder, but very interested, eager to learn and could translate. Thank you @elftok, @ryrhkqn and @ahmetusta. I've added Korean and Turkish to the list.
.@Georgian I'll have to find a way to expose those sections of the app to localisation. I'm interested in translating Codea in Macedonian, so I would be thankful if you could add Macedonian language.
.@Georgian I can't agree more .Comments localization is really important.btw,@Simeon ,please take those comments in Reference Documentation into consideration,too. Hi, can someone tell me how to get an original english version of Codea.
.@Dreamdancer you would have to set your iPad to English. Is it better if we remove the community-contributed Dutch translation in the next release? I do not think that you have to remove the dutch translation, there are maybe people who use it. Ofcourse It is easy to have the documentation in your own language, but keep the program original to avoid errors with accidental translated commands. If you translate everything in your own language you will lose the support of the Codea community. The updated iPad interface for the CrowdIn site is a real improvement. Though it appears to have trouble opening the third panel in the translating screen. Can those of us working on the French translation put together a list of agreed terms, including the equivalents we'll use for Pack, int, float, shader, touch and so on? Absolutely, are you able to organise agreed terms or do you need anything from me?
. @Simeon - it's not clear that all the French translators are using this discussion group or the CrowdIn one. When I started, I didn't look here for a while, and asked a question in the CrowdIn forum which had already been answered here. The CrowdIn site has a feature for terms, and I will experiment with setting some, but I would welcome feedback, suggestions, additions, and corrections ... Up to a point, and then we work with those terms (even if we're not certain about them) and a) complete the process and b) make it consistent. I'm thinking particularly of entier vs. integer vs int. @Simeon, it is your software and your documentation - your preferences or inclinations on translation may help resolve disagreements among volunteer translators who have less invested in it. And that may help us grind through Shaders. Here is another great translation tool for developers: https://poeditor.com/. I recommend you take a look.